Social graphics, those pictures you see on Facebook and Twitter with text, are a great way to spread the word about sales and other promotions. It’s also fun to make your own memes or other bite-sized images for the seasons or just to say hello to everyone. I love taking inspirational quotes and setting them to a graphical background, but some of the tools available are too limited. 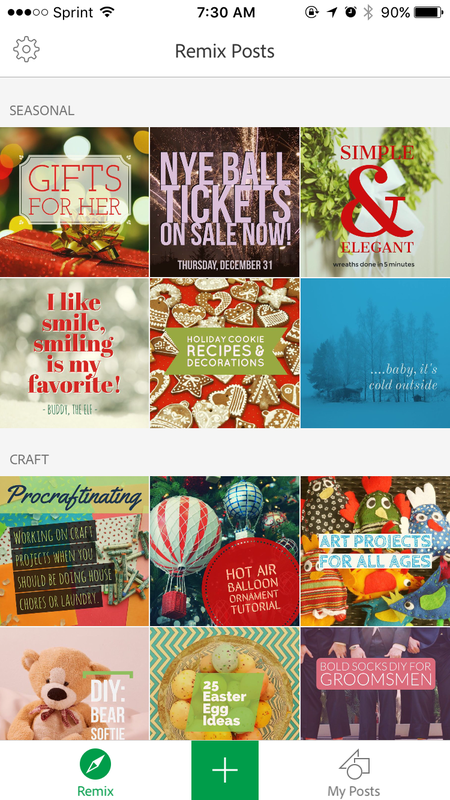 Enter the latest product in the Creative Suite collection of mobile apps, Adobe Post. 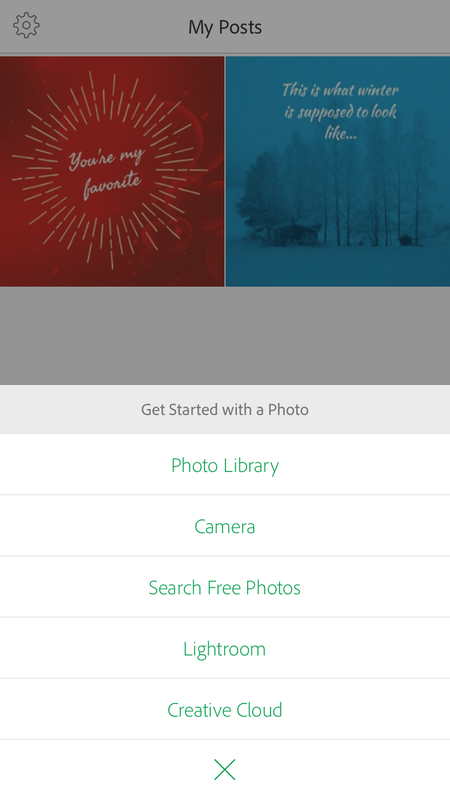 The core of Adobe Post lies in the curated examples that you can “remix” and make your own. These include high quality images along with a broad selection of shapes and fonts that you can use for your text and decoration. You can also change the color palette, apply filters, and change multiple settings for your shape and text. Every social graphic you create in Adobe Post has a watermark at the bottom right corner, but this is easily removed. 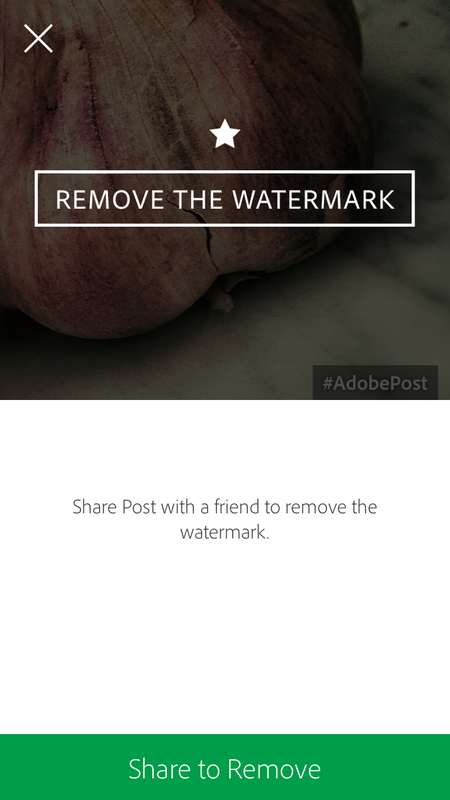 All you have to do is tap on the watermark in edit mode, and you’ll be prompted to share the creation. Once you’ve shared a creation, the watermark will disappear from all of your social graphics, and won’t show up again. If you aren’t excited by any of the curated examples you can remix, you can start your own social graphic from your Photo Library, camera, thousands of free photos available in-app, or images you have in Lightroom or Creative Cloud. 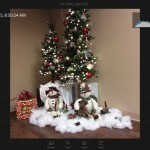 Once you choose your photo, you can easily add in shapes and text, creating the perfectly beautiful image that best represents what you want to convey to the world. Once you’ve finalized your design, Adobe Post makes it easy to share. 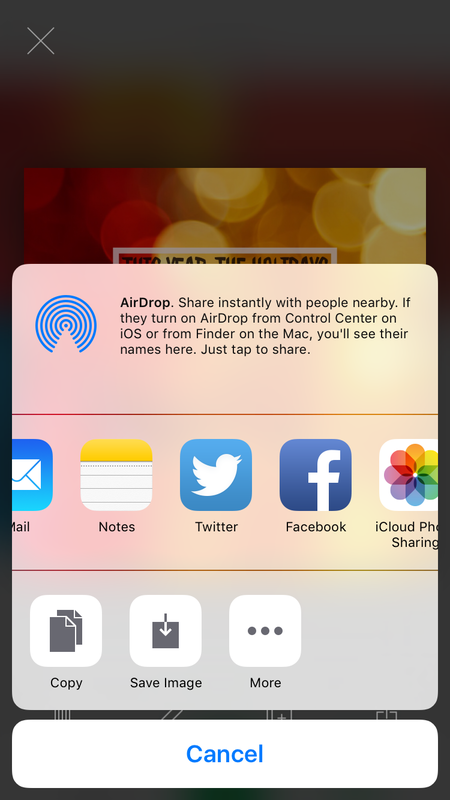 Just tap the Share button to easily send your new masterpiece to an email, Twitter, Facebook, Instagram, or anything else that you have a Share extension for. 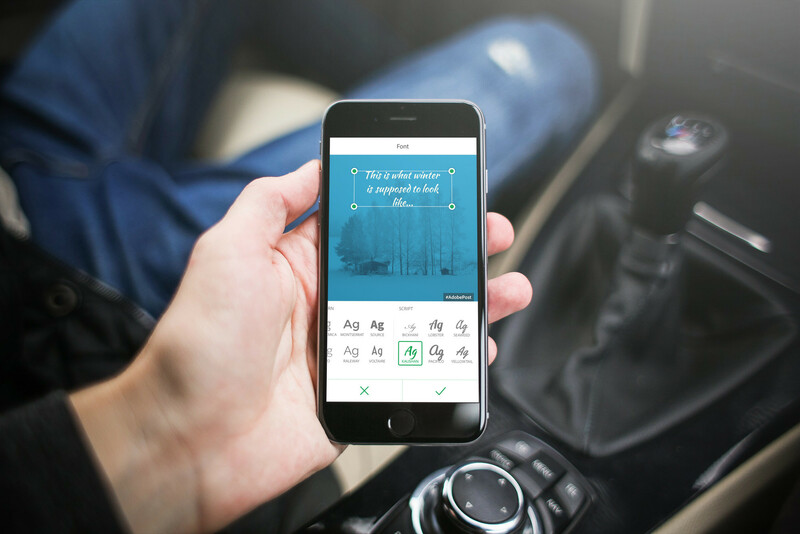 You can do everything from creating your graphic, editing it, and publishing it, straight from your iPhone as you commute on the bus or train to the office. 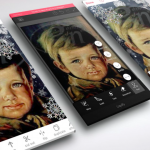 Adobe Post is designed for the iPhone, and requires iOS 8 or later. It’s a free download on the App Store without advertisements, but does offer in-app purchases if you need more Creative Cloud storage space than the free 2 GB Adobe provides you with.